No, We're Not All Cured, Yet! There have been so many advances in food allergy research, and there are treatment options that will be FDA approved over the next couple of years, for the treatment of peanut allergy. This is amazing, awesome, and hope-inspiring. I am excited at the prospect of these new treatment options, for those who don't currently have access to treatment, but I can't help but also have a nervous feeling about the reaction from the general public and the media. I am dreading seeing more headlines like, "PEANUT ALLERGIES CURED!" and other such sweeping declarations. They have already been floating around and we haven't even reached FDA approval, yet. To be sure, these will be celebratory events, but much of the past media reporting on food allergy advances has been hyperbolic and lacking in nuanced details. I imagine some people thinking to themselves, "Phew! Glad that whole mess is over!" and wanting to get right back to eating peanuts in every conceivable location. I feel that efforts to gain accommodations will be met with, "Why don't you just wear that patch/take that pill, etc.?" as if it's that simple. The following are some of the things to consider about treatment for food allergies. These initial treatments slated for approval are only focused on peanut allergies. Approximately 30% of those who have food allergies have multiple food allergies. 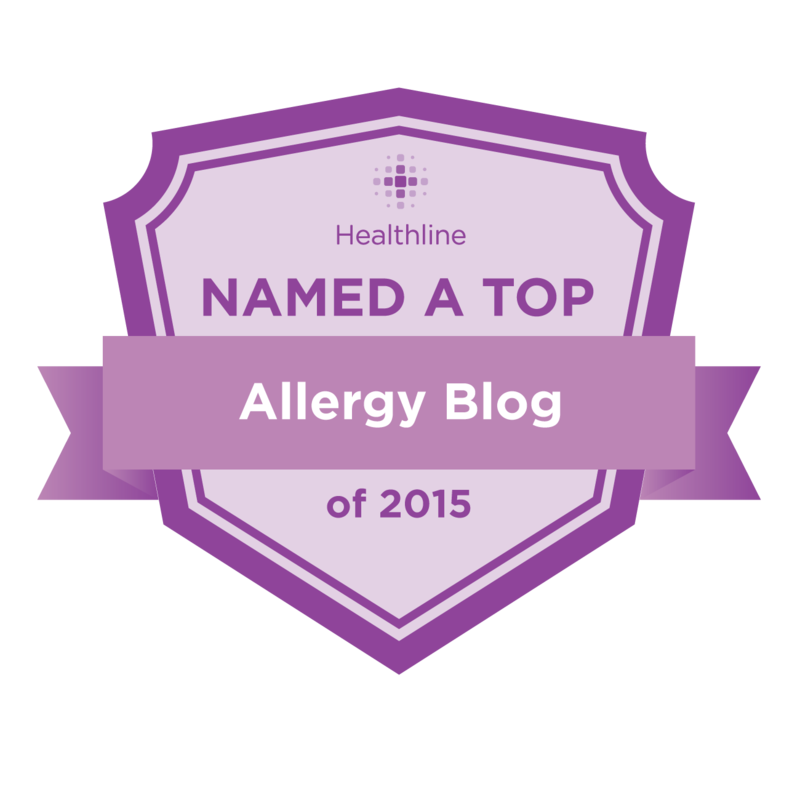 For those of us dealing with multiple food allergies, peanuts are sometimes the least of our concern. 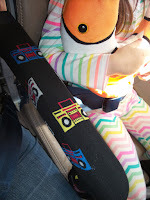 Dropping peanut from my daughter's allergen list will not really change our lives, as a whole. (Though, of course, it would be great - don't get me wrong!) Dropping milk, however, would change things, dramatically. In 2014, study findings showed that parents reported milk and egg allergies to be harder to manage than peanut. Just think of how many restaurant items are either slathered in butter or smothered in cheese. Some in the food allergy community may choose to wait until more of their most restrictive/severe food allergens can be addressed, either alone or together. As promising as the many treatment options are, none of them provide magical safety and protection overnight. They all require many months, to several years of treatment time. Currently, since there are no FDA-approved treatments available, patient options are limited to clinical trials and private practice options, neither of which might be locally available. When participating in a trial, the patient is on the trial timeline and could be in the placebo arm and spend a year without actual treatment. Even in "on-demand" private practice, patients cannot always "get in" to see their preferred provider, immediately. There may also be distance barriers involved. Office visits take time and this may mean time away from school, and time away from work for caregivers. Even when the first treatments gain FDA approval, the pricing of said treatments remains to be seen. Not everyone has "Platinum" insurance, with stellar coverage. It's easy for someone to say, "go cure yourself!" if they aren't the ones footing the bill and going through the potentially-arduous process. One of the treatments slated for FDA approval, Aimmune's AR101, involving a proprietary version of oral immunotherapy, carries the risk of side effects including gastrointestinal problems, and dose-related reactions up to and including anaphylaxis. The second treatment, DBV's Viaskin Peanut Patch, comes with the risk of skin irritation at the site of the patch. Aside from the risk of side effects, any treatment comes with the risk that it simply won't work for the particular individual. Everyone has their own unique immunological makeup and no single treatment will work for all. The food allergy community will continue its best efforts to educate everyone about recognizing the signs of anaphylaxis, avoiding accidental exposures to allergens, etc. Not everyone will be able to jump into treatment right away. Some, as it is their right to do, would like to wait for what they feel is safest treatment option. They may also choose no treatment, at all, for any number of reasons, and they must continue to be protected, as well. If you are outside of the food allergy world, please keep looking out for those with food allergies and bear with us, as we deal with this epidemic. Babies are born every day that may still develop food allergies. This isn't going to vanish in a single generation. Science moves more slowly than our patience might wish. It is never time to give up on being compassionate. There should be no expiration date for people's willingness to accommodate those in need of assistance. We are grateful to those who continue to support us as we make our way to a safer space. So, this was my daughter's first flight! We flew on Southwest Airlines. I have been flying Southwest since I was a child and I love it. We also have a rewards credit card* with them, that allows us to earn points towards free flights. As much as I love Southwest, I did have a moment's hesitation over the fact that they serve peanuts on their flights. 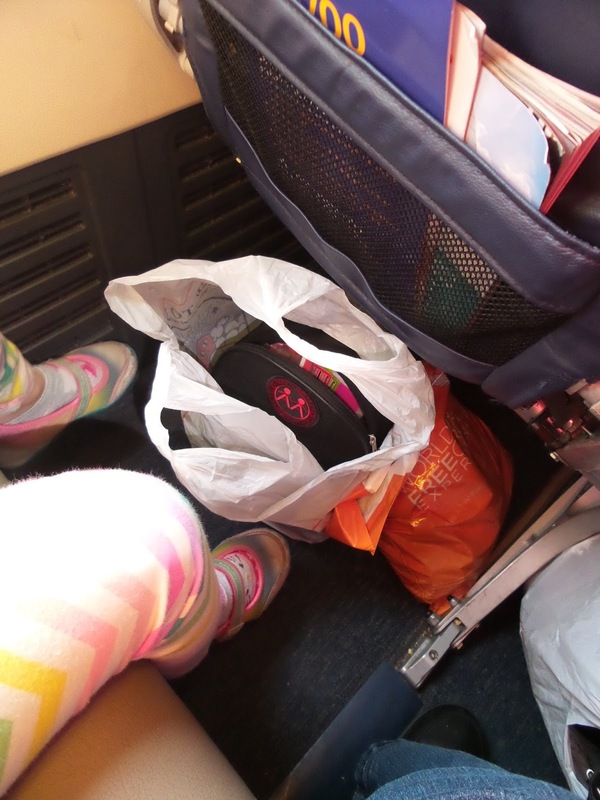 However, they grant pre-boarding authorization to those with peanut dust allergies to allow a moment for wiping the area before the other passengers board, and they will switch to a non-peanut snack for all legs of your trip. Southwest primarily serves the...you guessed it...southwest. There are no direct flights to New York and we had to change planes in Dallas (Love Field). I actually found it comforting to know that our very first flight would be a short one, with only 41 minutes of flying time. I've been flying pretty much my whole life and I enjoy it. I think air travel is amazing and it never gets old for me. Yes, I get sleepy and bored in between flights, but I find getting in a tube and flying thousands of feet in the air nothing short of miraculous. 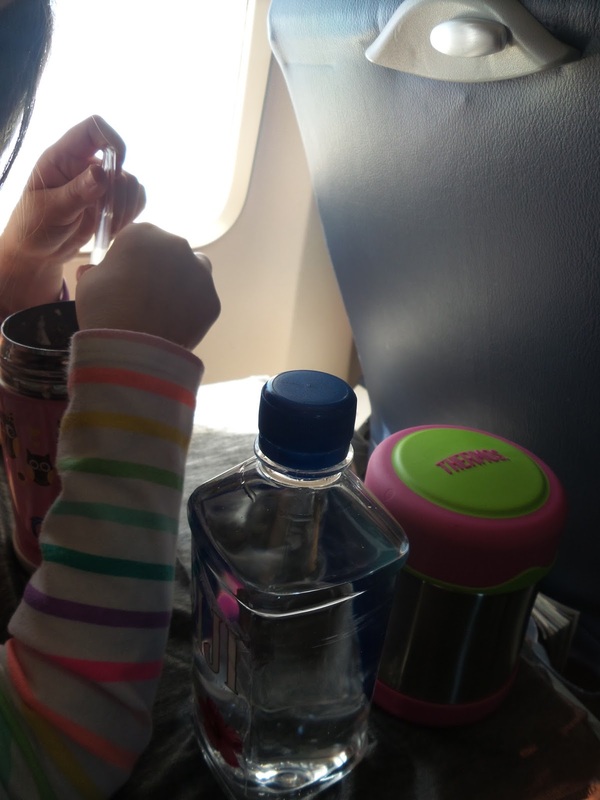 Even though I was definitely nervous about the "great unknown" of flying with my food-allergic daughter, I did my best to focus on the positives. I was so excited to be able to share this experience with my her - to have her see the clouds out the window, see the world looking so tiny down below, to watch the planes take off and land, to watch the luggage get loaded onto the planes...everything! I should add that being 18 months into treatment with Dr. Li, helped lessen my anxiety. I also reminded myself that this wasn't much different than the times we had visited the children's museums, though it adds a layer of stress being at 30,000 feet with nowhere to go in the event of a reaction. Even so, I felt more at ease than I might have felt pre-treatment. I explained to my daughter that the airline was nice enough to let us get on the plane a few minutes ahead of everyone else, to give us a chance to clean our seats. She is used to me wiping down the world, so she didn't find that to be too surprising. I packed travel Clorox wipes and a large Ziploc bag, to put my used wipes in, along with any contaminated trash. Aside from wanting to "quarantine" the wipes, I also wanted to contain their strong smell. I also packed napkins to use to dry the areas that I wiped, because we only had a few minutes before the rest of the passengers were coming in and I couldn't wait for air drying time. I had originally planned on using seat covers, but I was traveling solo and it was just too much to carry. I also doubt I would have had enough time to put them on and do the rest of my prep before the other passengers started filing in. All of the flights were completely full, so I had to prep, quickly! Middle image, above: One thing I forgot to do on the first flight was bring plastic bag to put our carry-on items in. I wanted something between our stuff and the possibly-peanut-laden floor. In between flights, I bought some water and asked them for a plastic bag and did the same when I bought something else. After I got off each flight, I threw out the used bags. Right image, above: For travel eating, I bought a couple of insulated food containers - one tall and one short. * In the tall one, I loaded it up with Annie Chun's Sticky White Rice* (which my daughter loves) and I put chicken nuggets in the other container. I also packed disposable covers for the tray tables. As far as staff accommodations went, I mostly encountered amiable flight staff, though I did get one sigh and eye roll when I handed one of the flight attendants the paperwork. One other flight attendant started handing out peanut packets out of habit and got them to about 6 people before I got his attention and he was apologetic and nobody seemed to make a stink about having their peanuts exchanged for crackers. (That was a bit of an awkward moment, but thankfully nothing came of it.) We sat pretty close to the front of the plane, so I don't know if there were any grumblings in the rows further back, though I didn't sense any. They did not make a "peanut allergy announcement" but I never saw anyone near us with their own peanuts, nor did I smell any during the flight. We did not take the first flight of the day, but all legs of our flights were still pretty clean. Overall, the flights went well, both to and from New York, and I was relieved. It was an experience reminiscent of using the EpiPen for the first time, only in the sense that I spent lots of time dreading it, only to find that doing it wasn't dreadful as I had imagined. We're due to make that trip, again, in a few months, so I figured I better get around to finishing this post! I always try to go into these situations armed with a smile and an obsequious manner, and I hope that the airline staff continue to be as supportive as they have been, in return, in the future. P.S. I'd like to add a "shout out" to Lianne Mandelbaum, of NoNutTraveler.com for all her hard work in trying to make the skies "friendlier" for those with food allergies! Check out her work and support allergic passenger protection legislation if and when you can. We don't always like to have to get legal, but not everyone has had pleasant encounters and that issue cannot be ignored. If you have any additional helpful tips, please feel free to leave them in the comments section!